Well, I’ve purchased quite a number. Also traded a lot. And have kept too many considering I regularly use just a few. I have no desire to entertain the monetary value I have spent on brushes and the total number I have owned. Let's just say that I greatly love using the current collection I have and I don't regret selling any brush, except a very small regret of selling both a Chubby 2 & 3 Silvertip 2-Band brush. Nonetheless, the three Shavemac D01 2-Band knots I have more than compensate for that. I have been gravitating the last few years around 50-60 brushes. Counting all that went through my hands it is probably around 150-200. I was going to do this, count the brushes. Then I thought, NO ! Sometimes its better not to know. Off the top of my head I’m presently hovering in the vicinity of 2 dozen brushes, most of which are Simpsons and Elite Razors. Three Semogues, two Endeavor Brush Works, a couple of Epsilons and perhaps an odd or an end for good measure. All my brushes are now either badger or synthetic. I went through a boar phase early on, but PIFfed all of them, less than a dozen, more than half a dozen. Probably close to 200 brushes and most of them badger but also includes 2 horse hair, 8 synthetic, 8 boars approximately. I've tried about 70 brushes and currently have 24. Mostly Rooney and Simpsons, but also a few from M&F, Paladin, Thater, Shavemac, & Semogue. After about $2000, I don't want to know. I have owned more than 100+ high end badgers and more than 25+ synthetics. I'm now the owner of 14 synthetics and 10 badgers. 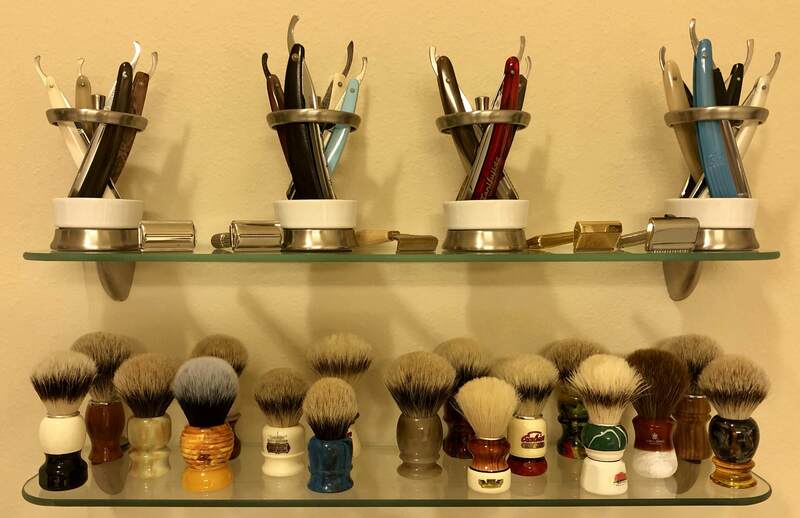 I have owned badgers from several brands - 20-25 Simpson brushes, 15-20 M&F, 12-14 Thäters, 20-25 Shavemacs, 8-10 Semogues, 3-4 Thiers Issard, 10-12 Rooney's, 8 Epsilons, 4 Kent and probably some brands that I have now forgotten about. Just the one's I gave my nephews (custom too) and pifs to military overseas...quite a few and approaching as one member said GNP of Samoa. I have owned well over 100 , I now have only 1. I regret selling many but I’m a minimalist and to acquire something new I always sell what I have , and for that I’m happy. (11-22-2018, 07:59 AM)ultra~nova Wrote: I have owned well over 100 , I now have only 1. I regret selling many but I’m a minimalist and to acquire something new I always sell what I have , and for that I’m happy. It’s tough but it makes the new brushes coming in really exciting to try something new, I have had some really legendary stuff and it was extremely difficult to sell but in true minimalist form I stay disciplined. One item I would have like to have kept a journal about. Through it all I have very little regrets, well maybe one or two. I guess the biggest is not buying more as I joined the hobby in 2009 and currently have a modest 17 in rotation and 3 on display. I could easily make it 6 to 10 and stop. The biggest thing is missing out on those Rooney’s Early on.